The bias Deestone D503 tires for light trucks are engineered for both on and off-road surfaces. They feature an aggressive tread design with a continuous zigzag center area to ensure stability, improve ride comfort, and enhance steering response. The spaced shoulder lugs provide self-cleaning capabilities and enhanced off-road cornering. On wet surfaces, the uniquely designed grooves drain water from the tread contact area to improve traction and safety. 7/--15 N/A 1,060 lbs 80 psi 13/32nds 6" 8" N/A 30"
Purchase includes the Deestone D503 tire only. The wheel rim shown in the picture is not included. Picture provided is a stock picture from the manufacturer and may or may not reflect the actual product being ordered. 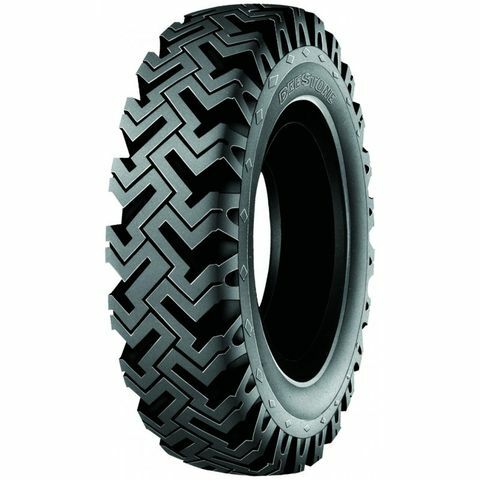 All Deestone D503 tires are continuously developing with manufactured improvements. With that said, Simple Tire and the manufacturers have the right to change these tire specifications at any time without notice or obligation. Please Note: Specifications of the Deestone D503 tires shown above are listed to be as accurate as possible based on the information provided to us by Deestone tires. I put 4 of these on my 1974 F250 4x4 Plow truck. I had the tires mounted and balanced. I have no handling issues till I hit 70mph then a slight vibration develops in one of the tires. So I drive 65mph in my 45 year old truck. We get a lot of snow in Montana and I have no problem driving through up to 18 inches of snow without a plow.